In churches today, little work goes into training. Gospel growth is seen as the job of the pastor, and since it is impossible for him to engage each member personally, everything is done at the large-group level. He becomes the manager of events, meetings, and groups. This is bad news because it encourages the congregation to be spectators. The good news is an alternative method proposed by The Trellis and the Vine by Australian authors Colin Marshall and Tony Payne. 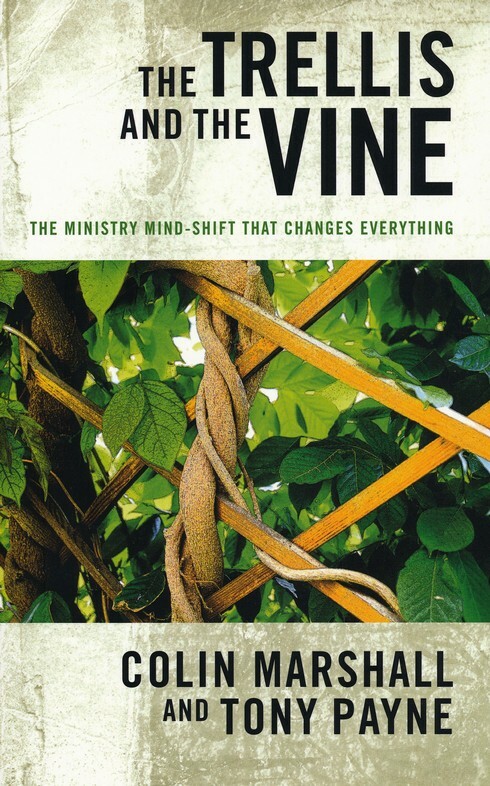 Their thesis is this: Structures don’t grow ministry any more than trellises grow vines. Churches must make a radical shift in ministry philosophy—away from erecting and maintaining structures, and towards growing people who are disciple-making disciples of Christ. “Training is the engine of gospel growth. Under God, the way to get more gospel growth happening is [for pastors] to train more and more mature, godly Christians to be vine-workers—that is, to see more people equipped, resourced and encouraged to speak the word prayerfully to other people, whether in outreach, follow-up or Christian growth” (90). The authors assert that the primary job of the pastor is to teach and train his congregation, by his word and life, to be become disciple-making disciples of Jesus. Payne and Marshall contrast Pastor as Trainer against two common models in today’s church: Pastor as Clergyman and Pastor as CEO. The Clergyman is like the one employee in a small corner store. He preaches, leads the service, counsels and does visitation. The CEO is like the leader of a large staff of a department store. He is the manager who oversees small groups, big events, and attractional meetings. The Trainer, however, is more like the coach of a team. He trains disciples to disciple others, encourages people ministering to people with the overarching goal that his congregation is continually in mission mode. The pastor’s aim in people work is developing mature vine-workers who can speak the truth of God to others. Gospel growth is a key term and is broken down into four basic stages: (1) Outreach (2) Follow-up (3) Growth (4) Training. The final goal is training others to multiply disciples. All Christians should teach others—whether at home, in the congregation, or in the community (Eph. 4:15-16; 6:4; Col. 3:16; rom. 15:14; Heb. 3:12-13; 10:24-25)—though not all are teachers (1 Cor. 12:29; Jas. 3:1). 1. We must be willing to lose people from our own congregation if that is better for the growth of the gospel. We may pour countless hours into people only to find that they will take another job elsewhere or enter another ministry. We train people for the benefit of God’s kingdom, not our own churches. 2. Ministry is people. It is a team game. “Up to 100 names are associated with Paul in the NT, of which around 36 could be considered close partners and fellow laborers” (112). 3. Don’t be a control freak. A bit of messiness is inevitable in this form of people ministry. Organizational chaos can be managed. Control of sound doctrine and godly character is the real issue. 4. The Gospel Growth Chart (87) helped me see my flock in a different light. The seven reasons for pastoral “apprentices” reminded me how vital internships are to the church (144-146). 5. Sunday sermons are necessary but not sufficient. Richard Baxter is the ultimate example of one who personally catechized and instructed his flock in their homes with the chief motive being the salvation of souls. The growth of the gospel is the focus in Scripture, not the growth of the church as a structure. The Trellis and the Vine implores a mind-shift from running programs and events (the trellis) to building and training people (the vines). This may at times be a chaotic and inconvenient strategy (training evangelists takes time) but in the end it will yield a stronger church. “The real work of God is people work—the prayerful speaking of his word by one person to another” (27). In sum, this highly practical book asserts that the goal of ministry is disciple making. “The sermon on Sunday should aim to make disciples” (153). Start with a few disciples, train them, and watch people multiply. The theme verse: “What you have heard from me in the presence of many witnesses entrust to faithful men who will be able to teach others also” (2 Tim. 2:2). Colin Marshall and Tony Payne. The Trellis and the Vine. Australia: Matthias Media, 2009. 196 pp. sounds excellent. can we borrow?